In March 2011, FPX Nickel was advised by Cliffs that, based upon positive results from preliminary metallurgical test work, it had approved a minimum 4,000-metre drilling program at Decar in 2011. Cliffs assumed management of the 2011 drilling campaign at Decar and hired consulting group Caracle Creek International Consulting Inc. (“Caracle Creek”)to supervise the drilling. Following an assessment of the metallurgical test results reported in July, Cliffs significantly increased its 2011 exploration and development budget for Decar to about US$7 million, and expanded and accelerated the pace of its exploratory drilling, such that, by the end of the field season in October, a total of 11,166 metres of diamond drilling in 36 holes had been completed. 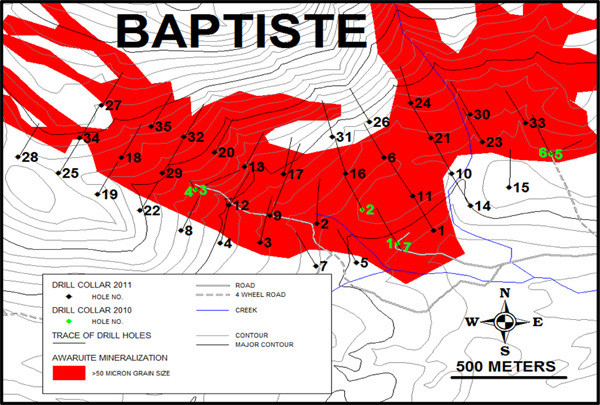 The Baptiste zone was tested in 2011 on 200-metre centres by 35 delineation core holes totalling 10,861 metres. A single exploration hole also tested Target B. The holes at Baptiste were drilled at a minus 50 degree angle in a northerly direction and were designed to test the mineralization to a depth of 300 metres down-hole, representing a vertical depth of 230 metres. The deepest hole, 11BAP-09, was drilled in the centre of the Baptiste zone to a down-hole depth of 606 metres, or about 460 metres vertically. The 2011 results, presented in the table below, returned long intersections of Davis Tube magnetically-recovered nickel in the range of 0.10% to 0.163% over lengths of up to 305 metres, which compares favourably to the results of the nine widely-spaced holes drilled in 2010. The nickel-alloy mineralization is hosted in serpentinized peridotite. The reported nickel grades are based on a threshold of 0.10%. Intercepts of non-mineralized dykes greater than 1 metre wide are reported as zero grade. The previously released 2010 drill results were reanalysed using the Davis Tube technique to assist in the interpretation of the geological model in preparation of the forthcoming mineral resource estimate. Upon assuming full operatorship of the project in the spring of 2011, a decision was made by Cliffs that thel drill core would be assayed and reported as Davis Tube magnetically-recovered (“DTR”) nickel. This analytical procedure involves the recovery of the magnetic fraction of the sample by magnetic separation using a Davis Tube, followed by standard assaying procedures to determine the nickel content of the magnetic fraction; in effect a mini-scale metallurgical test. The Davis Tube magnetic separation method recovers the highly magnetic nickel-iron alloy, as well as any other magnetic material, including magnetite, a primary ore mineral in many iron ores. Cliffs employs large scale magnetic separation methods in several of its operating iron ore mines. The Davis Tube method is the global, industry standard geometallurgical test for determining magnetic recovery. The assay samples from the 2010 drilling campaign that had been analyzed using FPX Nickel’s partial extraction assay procedures were reanalyzed using the Davis Tube technique in order to maintain the comparability of the information going into the resource database. Representative 1-metre-long samples of split drill core were collected every four metres down each hole. Drill core samples were shipped in batches to Activation Laboratories in Ancaster, Ontario for analysis. The laboratory protocol for DTR nickel involves a grinding/pulverizing stage, following which a 30-gram split is passed through a Davis Tube magnetic separator in slurry form to recover the magnetic fraction. This magnetic fraction is dried, weighed and analyzed by standard fusion XRF analysis that generates high quality multi-element data, including nickel analysis. The magnetically recovered nickel is calculated by multiplying the fusion XRF nickel value by the weight of the magnetic fraction, divided by total recorded weight. Standards, blanks and duplicates were inserted in the batches to provide quality control. Exploration drilling in 2011 was limited to a single hole on Target B, a distinct, outlying, highly prospective nickel-iron alloy target located 4.6 km north-northwest from Baptiste. Hole 11B-01 cut 258 metres averaging 0.138% DTR nickel. Visually estimated nickel-iron alloy grains reached 700 microns (or 0.7 mm) in size, representing some of the coarsest-grained mineralized material observed to date at Decar. The top of hole 11B-01 passed through 2.9 metres of overburden and 31 metres of metavolcanics and iron carbonate alteration, before intersecting the mineralized zone of serpentinized peridotite, which extended to the end of the hole at 301.5 metres depth. Environmental baseline studies commenced in May 2011 and include surface water quality and flow sampling at various monitoring stations, ground water quality sampling from select drill holes, a migratory bird survey, and an assessment of wildlife and fish habitats. 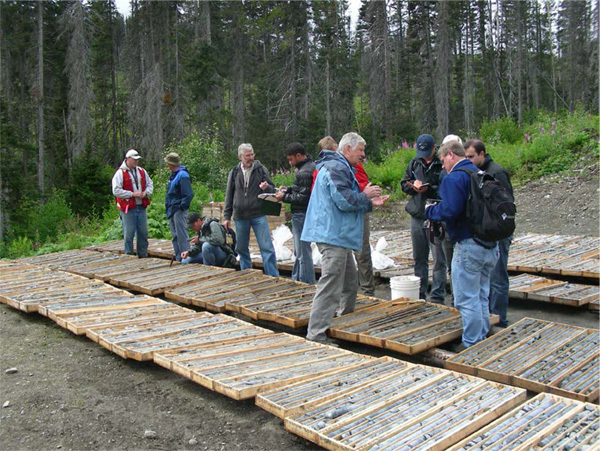 In April 2012, FPX Nickel announce the results of an independently prepared NI 43-101 compliant mineral resource estimate for the Baptiste deposit. The inferred mineral resource was estimated at 1.197 billion tonnes averaging 0.113% DTR nickel, equivalent to 2.982 billion pounds of magnetically-recovered nickel based on a cut-off grade of 0.06%. Using data from the 2010 and 2011 field season drilling in the Baptiste deposit (12,565 metres of core in 42 drill holes), an inferred mineral resource estimate meeting the requirements of NI 43-101 was prepared by Caracle Creek , which supervised and managed the 2011 drilling program on behalf of Cliffs. The mineral resource block model was reviewed on Cliffs’ behalf by Roscoe Postle Associates (“RPA”), an egineering and geological consulting firm. The mineralized body is bound to the south and west by steeply dipping faults. The northern and eastern limits to mineralization remain open, but were constrained in the model by a 100-metre step-out equal to half the drill hole spacing. The bottom boundary was extended past the final depth of drilling by 100 metres. A specific gravity of 2.7 tonnes per cubic metre was used for the resource estimate. This value was based on the analysis of 300 samples of the mineralized peridotite host rock by Activation Laboratories in Ancaster, Ontario. In total, 325 samples were analyzed for specific gravity, including rock types other than peridotite. The April 2012 mineral resource estimate was completed by Jason Baker, P. Eng., of Caracle Creek, an independent qualified person as defined by NI 43-101 Standards of Disclosure for Mineral Projects. Luke Evans, P.Eng, of RPA, an independent qualified person as defined by NI 43-101, and Valerie Batterham, Senior Geologist with RPA, were responsible for reviewing and approving this mineral resource estimate. RPA reviewed, verified and approved the technical data and underlying sampling, analytical and test data used by Caracle Creek in the resource estimate. The mineral resource estimate is classified as inferred, consistent with the Canadian Institute of Mining, Metallurgy and Petroleum (“CIM”) definitions referred to in NI 43-101.